Hong Kong: Asian companies and government funds are set to keep up their global buying spree in 2008, powered by a sagging dollar, cheap targets in the financial sector and strong balance sheets. Marching ahead: Goldman Sachs office in New York. It was one of the top advisers in Asia in 2007. Given the high valuations in China and India, overseas purchases are likely to predominate cross-border deals in 2008. That momentum is poised to continue as Asian buyers using swelling foreign exchange reserves look for natural resources, brands, distribution and know-how. Banks and government funds, meanwhile, are stepping in to bail out Western financial institutions reeling from the subprime mortgage crisis. “Asian buyers are seeking (financial institutions), natural resources and consumer plays in the West," said Kalpana Desai, head of Asia M&A for Merrill Lynch & Co. Inc. “M&A volumes will be higher in 2008 than in 2007, and will be more China-driven than India-driven," she added. On Monday, the Government of Singapore Investment Corp. Pte Ltd (GIC) paid $9.75 billion (Rs38,415 crore) for a 9% of subprime-battered UBS AG. Another Singapore government fund, Temasek Holdings Pte Ltd is believed to be eyeing stakes in banks, including London-based Barclays Bank Plc., which it already owns 2.1% of, and US investment banks such as Merrill Lynch. GIC’s deal tops the recent $7.5 billion investment by the government of oil rich Abu Dhabi in New York’s Citigroup Inc., another casualty of the subprime mortgage meltdown. 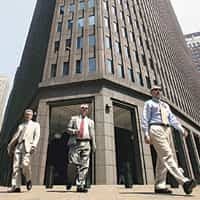 “The reason why you’ve seen increased acquisitions taking place in the financial services industry is partly because people don’t want to hold US dollars in the form of treasury securities," said Colin Banfield, head of Asia ex-Japan M&A at Lehman Brothers Holdings Inc. “If you’re going to hold US dollars, you might as well invest in an actual operating entity given what’s happened to relative valuations on assets and the weakness of the US dollar." The dollar has fallen almost 10% this year against a basket of currencies, while the yield paid on benchmark 10-year treasuries has declined to around 4.15% from a peak of more than 5.3% in June. The buyout firepower wielded by big Asian companies and wealth funds, including Beijing’s new $200 billion China Investment Corp. (CIC), has meant names from the region crop up as potential buyers whenever a big asset comes on the block. China, for example, is seen as a would-be participant in the battle for miner Rio Tinto Plc., which is trying to fend off a $140 billion bid from BHP Billiton Ltd. Chinese banks, meanwhile, were invited to look at the struggling UK lender Northern Rock Plc., sources said. “One major theme, we believe, will be the acceleration in the number, size and profile of outbound Asian deals," said Ed King, head of Asia-Pacific M&A for Morgan Stanley. This year saw Industrial and Commercial Bank of China Ltd, the world’s most valuable lender, pay $5.6 billion for 20% of Standard Bank of South Africa Ltd. Earlier, CIC invested $3 billion in US buyout firm Blackstone Group LP. Asia ex-Japan M&A volumes have surged 77% to $751.5 billion this year, data from Thomson Financial shows, including outbound deals that tripled to $375 billion. The figures include BHP’s offer for Rio and other pending deals. UBS, Morgan Stanley and Goldman Sachs Group Inc. were the top advisers in Asia this year. Given high valuations in China and India, as well as the difficulties of making acquisitions in China, overseas purchases are expected to predominate among cross-border deals in 2008. Companies in mainland China and Indian firms are trading on multiples of 40 and 23.5 times forecast earnings, respectively, compared with price-earnings multiples of around 13 times in Europe and 16.3 times in the US. The deals keep coming. On Friday, China’s Sinosteel Corp. offered $1 billion for Australian iron ore miner Midwest Corp. Ltd. On the same day, China Minmetals Non-ferrous Metals Co. Ltd and Jiangxi Copper Co. Ltd launched an agreed $450 million offer for Canada’s Northern Peru Copper Corp. In India, Tata Motors Ltd and rival Mahindra & Mahindra Ltd are vying for Ford Motor Co.’s Jaguar and Land Rover brands in a deal that may fetch $1.5 billion. “Chinese and Indian companies have solid balance sheets and lots of cash," said Jason Rynbeck, head of Asia M&A at ABN Amro Bank NV, referring to the Chinese currency, also called the yuan. “If the renminbi continues to strengthen, that could give China an edge." South Korean firms are also expected to step up their shopping overseas, following Doosan Infracore Co.’s $4.9 billion purchase of construction gear maker Bobcat Co. from Ingersoll-Rand Co. Ltd, in the country’s largest outbound deal. “There is ample funding and financing and government support for Korean corporates to become much more international," said Lehman’s Banfield.